There is nothing worse than not being able to sleep. It is one of the worst feelings in the world. And, in fact, you are doing lots of damage to your health by not being able to sleep. Here’re 8 tips for better, more effictive sleep. Many are simply unaware of the metabolic, neurologic and long-term consequences of sleep loss. And yet – most of us are sleep deprived. This would help explain our widespread addiction to caffeine. And in today’s hyper-digital, fast-paced world, a good night’s sleep is more necessary than ever. Do you remember how you slept as a child? Undisturbed, easily, and restfully? You still need that level of sleep as an adult. Like water, food and money – we all need good quality sleep. This guide will help you get there, but you must make high quality sleep a priority – on a daily basis – if you want optimal health. There is a plethora of evidence that poor sleep does damage to many different aspects of our health. Poor brain function, weight gain, increased risk of death – you name it, poor sleep affects it. On top of that, sleep loss is cumulative – meaning all those lost nights or nights with only a few hours of sleep – they all count against you. I know, I can hear you gasping right now – but it’s true. Since your hormones run your life, it is absolutely vital that we keep them in check and balanced — and nothing throws them out of whack quicker than not getting sleep. Your glucose tolerance is quickly affected by sleep loss (this means you can’t eat as much sugar, in essence) and that is just the tip of the hormonal iceberg, when it comes to sleep loss. If you’re getting less than 7 hours – say hello to diabetes – which you are now much more likely to get. Since we just covered hormonal problems, and hormones are related to food intake, you can begin to connect the dots here. A poor-quality diet and sleep loss are also related, and it is not shocking to see why. If you don’t eat well, your hormones get out of whack, and you likely won’t be able to sleep well, either. It is truly a vicious cycle. A great diet, on the other hand, will help to balance your hormones, and will help you sleep better as a result. It is no secret that we are stressed like never before in history. With every bit of knowledge and stimulation at our fingertips, we are expected to be ‘on’, more and more. And boy, does stress affect sleep! Limit the amount of stress you let yourself feel, and spend time before bed meditating and relaxing. No excuses here – make it happen! For many clients, I have to make this part of their routine a component of their ‘workout’. Otherwise they won’t take it seriously and prioritize it. But you won’t be working out if you’re not sleeping optimally. One element that many people may not be aware of yet is another example of how our modern world is causing us to get poor sleep. That element is too much exposure to blue light, especially right before we go to bed. Blue light is most commonly seen as the light coming from basically any source that is not the sun. Your television – a source of blue light. Your phone – another source of blue light. Your tablet – you guessed it, blue light. Your computer – more blue light. Though there are many other devices and sources of blue light within your home and found in our daily life, imagine all of the exposure you are getting on a daily basis – from just the sources listed above. You can begin to see the problem here. Harvard found that basically any light at night is bad for your health – with blue light being the worst kind. Now that you understand just how much damage blue light is doing to our health and sleep, it will hearten you to know that there is a simple application for your phone, computer, and tablet, which will automatically block out blue light. If you go here you can download this free application, which is absolutely vital for those of us who like to look at screens right before bed (read: just about everyone). Just Get Flux is extra nifty because it will automatically set the light temperature for the time and time zone – meaning you just install the app, and never think about it again. The effect will be immediately noticed. All of the sudden you will yawn again, even if you’re working on a paper late at night. Your melatonin production actually shifts, when not exposed to blue light. This is why it can be so disrupted if we look at blue light in the immediate time right before bed. This is truly a must-have app. If you want to take things a step further, you can get these cool blue blockers, shown above (sported by Nom Nom Paleo). Blue blockers aren’t very expensive, and though somewhat dorky, they will definitely improve your health. These are best for those who cannot control their whole house, or living situation, or for those who hate installing any kind of software. One other element that most are unaware of when it comes to controlling sleep quality is making sure their bedroom is as dark as possible. And I do mean dark. As Robb Wolf has pointed out, one study showed that a small light on the back of a subject’s knee disrupted their sleep quality! Most bedrooms are not dark at all – with modern electronics again being the key issue. 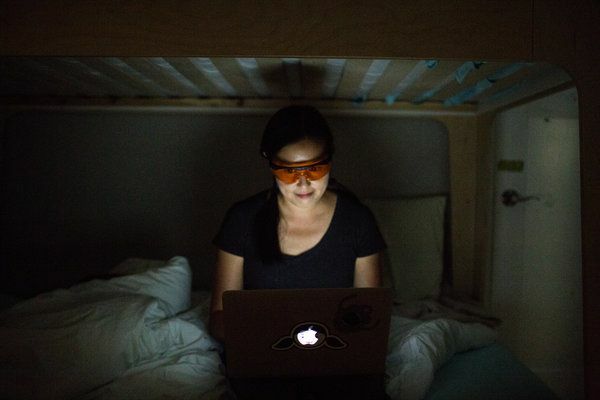 Blackout shades, covering up electronics which emit light, and checking to make sure absolutely no light gets into your bedroom – are all hallmarks of optimal sleep quality and duration. If you close your shades during the day, and you can still see light sneaking in – you have yet to complete your mission. Often, it will take 2-3 layers of blocking, and some well-placed hooks and/or clips, to completely seal off windows from light. But believe me – it is worth it. When was the last time you slept for 10 hours? I bet it’s been awhile. For me, it was 2 nights ago. Why? Because my bedroom is more or less a cave. No light, no sound – complete isolation. For many of us who are already suffering from busy schedules and high stress, a completely dark bedroom is the only way to maintain our sanity. This dark room is also completely vital for shift workers, college students and anyone who has any trouble at all with sleep. Of all the techniques in this article, this may be the most important one for everyone to implement. I urge you to go out today and buy blackout shades, if you haven’t already. This is the best investment you will ever make, because amazing sleep quality is the best return on investment there is. Though all of the above steps should be tried before supplementation, there are a few key supplements that may push your sleep to the next level. The first is melatonin, which is a hormone that you should be secreting optimally around bedtime. However, since many have disrupted their hormones, they are faced with supplementing, in order to help getting to sleep earlier, faster, or at all. Start with 1 mg, and do not exceed 5 mg. Also, consult with your physician before taking melatonin. Another interesting supplement one can try here is holy basil. This supplement helps to deal with cortisol, which can be problematic when one is very stressed, or they are simply on an irregular schedule. Holy basil can also help with blood sugar levels, so be sure to include it if you have issues with that, as well. This is an herb that is best supplemented at about 2 grams per day. Again, speak with your physician before trying this supplement. It can be quite scary to realize just how much poor sleep can damage our health. But on the plus side, we are also empowered by this knowledge, since we are almost entirely in control of our own sleep schedule. And if you’re not in control of it – get in control of it. You will be very thankful you did, since besides a good diet, sleep is the single best thing you can do for your own health. And remember – we all need it, just like water, food and money – to live optimally.